Our Father's Festival! - ~ Activities ~ Worship Services Community Out-Reach Dancing Field Day Hiking Potlucks Resource Center Seniors Shopping & Entertainment Sightseeing Singles Sports & Fitness * Details are added as they become available * Campfire Social Circle is where brethren may gather at a site located near the dome and away from other tents so that they may socialize into the late hours without offending others who wish to get to bed at an earlier time. Community Out-Reach! We consider this one of the most important activities of Our Father’s Festival. By participating, we show the courage, hope, and light within us by sharing the rejoicing of the Festival and Our Father’s and Christ's message of the Gospel to area residents. Our Father’s Festival on the Courthouse Plaza! There are 4 Festival Break-Out sessions scheduled to take place on the Plaza during the Festival. The Yavapai County Courthouse Plaza and downtown Prescott is known State-wide, and now, as of October 8, 2008, nation-wide as one of America’s 10 Great Public Space—along with the company of such iconic places as Central Park in New York City and Santa Monica beach. People walk (3 laps=1 mile) and enjoy the Plaza ambience all day and into the night! Thousands of people congregate on the Plaza and closed downtown streets to engage in holiday festivities during the year. In the spring, summer, and early fall it is the popular and safe location of many events: antique car shows, concerts, fairs, festivities, movies, races, religious and political presentations, etc. On Tuesday evening, the Festival band will present a concert and lead us in our Celebration of the Festival of Tabernacles. In-between the songs, we will share short comments for our listening audience about the true timing of Christ’s birth (in the Fall), and the meaning of the Festival to those who have gathered on the Plaza to watch and participate with us. We hope you support this activity by at least one of the following-and hopefully more: 1) attending, 2) clapping hands, 3) dancing (dance lessons are offered at the Festival), 5) singing, 6) shofar blowing, and 7) bringing a light! We ask you to bring a candle or flashlight to the Plaza to symbolize Our Savior as the Light of the world, and us individually as lights (Matt 5:14). We also will ask Prescottonians to join us in singing, and, also, bring their candles or flashlights. Announcements will be made locally. Discipleship. Are we ready…to “do” (Dan11:32)? In our everyday, busy lives, not many of us are able or wish to do this. Yes, we may share with others, but mostly we let others do the preaching and teaching to the world. Let’s rejoice and be a disciple–not just a believer–as we reach out to others to share the Gospel. How? By simply showing our rejoicing at His Festival on the Plaza! Let’s have some fun! We hope you choose to participate. It will be an exciting, fun, opportunity for you to step forward to let your light shine (yes–your’s!) as we learn “to do” as believers and disciples–and carry the message of Our Father’s Festival and His coming Kingdom! Purpose. The purpose for holding the Break-Out sessions on the Plaza is *not* to proselytize, but to share the teaching presentations with others in the community, and also to share our joy and inward light that we bring to the Festival by honoring our Father. Are we ready…to “do” (Dan11:32)? Make no mistake…the eyes and ears of Prescott will be upon us at this popular gathering place of the community. On Tuesday evening people will hear and see the band and Believers sing-out songs of praise to celebrate the Feast. We will catch their attention. Let us go up (ALIYAH) to be disciples! It will be an exciting, fun, opportunity for you to step forward to let your light shine (yes–your’s!) as we learn “to do” as believers and disciples–and carry the message of Our Father’s Festival and His coming Kingdom! Congregational Worship / Teaching Services. Worshiping and rejoicing as a congregation of believers along with the teachings and fellowshipping are the primary reasons for this season. There will be many activities offered at the Festival and we encourage all to seek balance–especially those with families–since this a vacation time for many. Remember the real reason for the Festival. Dancing. We will learn Davidic Dancing–a means of praising (Ps. 150:4) our Father through the dance (Ecc. 3:4). Men, women, and children are encouraged to join in the workshops to learn the basic steps so they can join in during praise and worship time, and also at Community Out-Reach. For those of you who like more of a challenge, expand your dancing by learning some beginning choreography. Field Day. Individual and team contests suitable for the entire family at the soccer field! Water balloon toss,lemon derby, clown relay, red light-green light and other picnic type physical activities, with prizes for the kiddies (of all ages).o food is provided; participants are encouraged to bring along munches to share! Gym will be available for use as indicated on the schedule, and more times if interests warrants it. Hayride. For kids of all ages under the light of the silvery full moon! Hiking. One leader-led hikes will be offered to one of the below location depending on the interest. Free. Transportation needed to the Trail-heads. Meet at the Registration Table for transportation and to “convoy” to the trailhead! Bring bottled water!1) Thumb Butte Trail (moderate) about 2 miles round trip to the panoramic view combing with a Nature Break-out Session. Note: $2 parking fee per vehicle. You may wish to bring along a powerbar.2) Peavine Trail (easy) 5.2 miles (one way) with the first 1.5 miles past Watson Woods and Watson Lake and the remainder into the scenic Granite Dells. Bicyclists can bike this easy trail, too! Karaoke and Sing-a-Long. For everyone! Morning Coffee and Tea. For Everyone...in the Dome. Potlucks. A Traveler's Meal will be provided on the first night of the Festival for both calendar observing groups! So pitch yer tent / get your room, unpack, and give Mom a rest from cooking the first night of the Festival! Relax as we 'locals' prepare the food for you the first night! For those following the Karaite / Sighted Moon Calendar, the 'locals' will provide your share of the 'fixin's' at the community potluck! We will have 3 potluck evening meals during the Festival for everyone to fellowship over festival food. Please remember...for our potlucks please refrain from bringing pork (ham, bacon, etc), "imitation" ham and crab, seafood ((crab, shrimp,etc), and catfish--but other non-scavenger fish types are "OK"'–so we may honor those following the Scriptural dietary teachings. We will ask you to label the ingredients on 3"x5" cards (provided at the potluck table) along with ingredients that may cause allergic reactions such as lactose and peanuts. Resource Center will be located at the Camp to offer books, tapes, and other items from the ministry, as well as related crafts from members. Do you have a particular Scriptural craft or clothing to offer the brethren? Seniors. A senior's coffee will be offered. (See Schedule) Sightseeing, Shopping & Entertainment (See below). Singles. Would you like to meet other singles in a relaxed, social atmosphere? There will be a Single's Morning Coffee early in the Feast to acquaint everyone. (See Schedule).How about a hike after a potluck meal? Let us know what type of activities you would enjoy! Sports and Fitness. The Festival is a time for spiritual rejuvenation, relaxing fellowship, and of course… feasting! But, it’s always good for kids of all ages to keep their blood and legs moving for alert minds and healthy hearts. Check the festival schedule and program for the activities offered.Golf Antelope Hills Golf Course: Two public 18-hole courses (North Course and South Course) with clubhouse and restaurant located north of Prescott on Hwy 89 near the airport. (Located about 10 miles north of the Camp).Hiking. We will offer maps (and lead some hikes if the interest is there) to a few of the most popular trails in the area including the Granite Mountain Wilderness, Lion’s Club Nature Trail, Peavine Trail, and Thumb Butte Mountain.Peavine Trail. 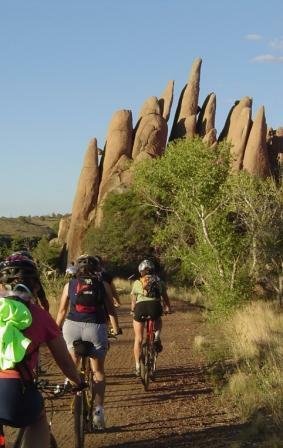 Explore the Peavine Trail via hike or bike, so named because of the former railroad which wound through the Granite Dells Rocks like a peavine plant. A scenic trail with historic markers and some railroad memorabilia. Bikes may be rented from local bike shops.Kayaking: Available through local commercial outfitters are kayaks for Prescott’s Watson and Wilson Lakes Lakes. There are several small lakes in the area to explore including Goldwater, Lynx, Watson and Willow Lakes (at the Granite Dells).Swimming Pool. In 2009 we expect wamer temperatures in the mountains to allow the camp swimming pool to be open as indicated on the schedule.Walking and Jogging. Wish to join others at the Festival for a “walk in the park” or a jog? It’s more fun to walk and talk! Be sure to sign up! Explore the scenic Granite Dells by canoe, kayak, hiking or biking the Peavine Trail past Point of Rocks (on right). Teens. Bowling? Dancing? Freedom Station? Game day? Hiking? Teens--let us know what interests you! (Under Construction) Activities will be provided depending on the interest shown by others on the Pre-Registration form, not only to participate, but to lead and organize. The number of organized Festival activities we have will depend on everyone's willingness to volunteer! Campfire Social Circle is where brethren may gather at a site located near the dome and away from other tents so that they may socialize into the late hours without offending others who wish to get to bed at an earlier time. Community Out-Reach! We consider this one of the most important activities of Our Father’s Festival. By participating, we show the courage, hope, and light within us by sharing the rejoicing of the Festival and Our Father’s and Christ's message of the Gospel to area residents. Our Father’s Festival on the Courthouse Plaza! There are 4 Festival Break-Out sessions scheduled to take place on the Plaza during the Festival. The Yavapai County Courthouse Plaza and downtown Prescott is known State-wide, and now, as of October 8, 2008, nation-wide as one of America’s 10 Great Public Space—along with the company of such iconic places as Central Park in New York City and Santa Monica beach. People walk (3 laps=1 mile) and enjoy the Plaza ambience all day and into the night! Thousands of people congregate on the Plaza and closed downtown streets to engage in holiday festivities during the year. In the spring, summer, and early fall it is the popular and safe location of many events: antique car shows, concerts, fairs, festivities, movies, races, religious and political presentations, etc. On Tuesday evening, the Festival band will present a concert and lead us in our Celebration of the Festival of Tabernacles. In-between the songs, we will share short comments for our listening audience about the true timing of Christ’s birth (in the Fall), and the meaning of the Festival to those who have gathered on the Plaza to watch and participate with us. We hope you support this activity by at least one of the following-and hopefully more: 1) attending, 2) clapping hands, 3) dancing (dance lessons are offered at the Festival), 5) singing, 6) shofar blowing, and 7) bringing a light! We ask you to bring a candle or flashlight to the Plaza to symbolize Our Savior as the Light of the world, and us individually as lights (Matt 5:14). We also will ask Prescottonians to join us in singing, and, also, bring their candles or flashlights. Announcements will be made locally. Discipleship. Are we ready…to “do” (Dan11:32)? In our everyday, busy lives, not many of us are able or wish to do this. Yes, we may share with others, but mostly we let others do the preaching and teaching to the world. Let’s rejoice and be a disciple–not just a believer–as we reach out to others to share the Gospel. How? By simply showing our rejoicing at His Festival on the Plaza! Let’s have some fun! We hope you choose to participate. It will be an exciting, fun, opportunity for you to step forward to let your light shine (yes–your’s!) as we learn “to do” as believers and disciples–and carry the message of Our Father’s Festival and His coming Kingdom! Purpose. The purpose for holding the Break-Out sessions on the Plaza is *not* to proselytize, but to share the teaching presentations with others in the community, and also to share our joy and inward light that we bring to the Festival by honoring our Father. Are we ready…to “do” (Dan11:32)? Make no mistake…the eyes and ears of Prescott will be upon us at this popular gathering place of the community. On Tuesday evening people will hear and see the band and Believers sing-out songs of praise to celebrate the Feast. We will catch their attention. Let us go up (ALIYAH) to be disciples! It will be an exciting, fun, opportunity for you to step forward to let your light shine (yes–your’s!) as we learn “to do” as believers and disciples–and carry the message of Our Father’s Festival and His coming Kingdom! Congregational Worship / Teaching Services. Worshiping and rejoicing as a congregation of believers along with the teachings and fellowshipping are the primary reasons for this season. There will be many activities offered at the Festival and we encourage all to seek balance–especially those with families–since this a vacation time for many. Remember the real reason for the Festival. Dancing. We will learn Davidic Dancing–a means of praising (Ps. 150:4) our Father through the dance (Ecc. 3:4). Men, women, and children are encouraged to join in the workshops to learn the basic steps so they can join in during praise and worship time, and also at Community Out-Reach. For those of you who like more of a challenge, expand your dancing by learning some beginning choreography. Field Day. Individual and team contests suitable for the entire family at the soccer field! Water balloon toss,lemon derby, clown relay, red light-green light and other picnic type physical activities, with prizes for the kiddies (of all ages).o food is provided; participants are encouraged to bring along munches to share! Gym will be available for use as indicated on the schedule, and more times if interests warrants it. Hayride. For kids of all ages under the light of the silvery full moon! Hiking. One leader-led hikes will be offered to one of the below location depending on the interest. Free. Transportation needed to the Trail-heads. Meet at the Registration Table for transportation and to “convoy” to the trailhead! Bring bottled water! 1) Thumb Butte Trail (moderate) about 2 miles round trip to the panoramic view combing with a Nature Break-out Session. Note: $2 parking fee per vehicle. You may wish to bring along a powerbar. 2) Peavine Trail (easy) 5.2 miles (one way) with the first 1.5 miles past Watson Woods and Watson Lake and the remainder into the scenic Granite Dells. Bicyclists can bike this easy trail, too! Karaoke and Sing-a-Long. For everyone! Morning Coffee and Tea. For Everyone...in the Dome. Potlucks. A Traveler's Meal will be provided on the first night of the Festival for both calendar observing groups! So pitch yer tent / get your room, unpack, and give Mom a rest from cooking the first night of the Festival! Relax as we 'locals' prepare the food for you the first night! For those following the Karaite / Sighted Moon Calendar, the 'locals' will provide your share of the 'fixin's' at the community potluck! 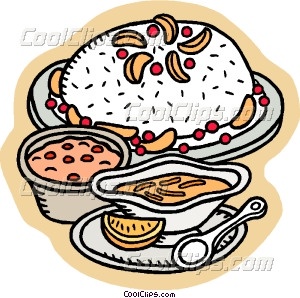 We will have 3 potluck evening meals during the Festival for everyone to fellowship over festival food. Please remember...for our potlucks please refrain from bringing pork (ham, bacon, etc), "imitation" ham and crab, seafood ((crab, shrimp,etc), and catfish--but other non-scavenger fish types are "OK"'–so we may honor those following the Scriptural dietary teachings. We will ask you to label the ingredients on 3"x5" cards (provided at the potluck table) along with ingredients that may cause allergic reactions such as lactose and peanuts. Resource Center will be located at the Camp to offer books, tapes, and other items from the ministry, as well as related crafts from members. Do you have a particular Scriptural craft or clothing to offer the brethren? Sightseeing, Shopping & Entertainment (See below). Singles. Would you like to meet other singles in a relaxed, social atmosphere? There will be a Single's Morning Coffee early in the Feast to acquaint everyone. (See Schedule).How about a hike after a potluck meal? Let us know what type of activities you would enjoy! Sports and Fitness. The Festival is a time for spiritual rejuvenation, relaxing fellowship, and of course… feasting! But, it’s always good for kids of all ages to keep their blood and legs moving for alert minds and healthy hearts. Check the festival schedule and program for the activities offered. Golf Antelope Hills Golf Course: Two public 18-hole courses (North Course and South Course) with clubhouse and restaurant located north of Prescott on Hwy 89 near the airport. (Located about 10 miles north of the Camp). Hiking. We will offer maps (and lead some hikes if the interest is there) to a few of the most popular trails in the area including the Granite Mountain Wilderness, Lion’s Club Nature Trail, Peavine Trail, and Thumb Butte Mountain. Peavine Trail. Explore the Peavine Trail via hike or bike, so named because of the former railroad which wound through the Granite Dells Rocks like a peavine plant. A scenic trail with historic markers and some railroad memorabilia. Bikes may be rented from local bike shops. Lakes. There are several small lakes in the area to explore including Goldwater, Lynx, Watson and Willow Lakes (at the Granite Dells). Swimming Pool. In 2009 we expect wamer temperatures in the mountains to allow the camp swimming pool to be open as indicated on the schedule. Walking and Jogging. Wish to join others at the Festival for a “walk in the park” or a jog? It’s more fun to walk and talk! Be sure to sign up! Explore the scenic Granite Dells by canoe, kayak, hiking or biking the Peavine Trail past Point of Rocks (on right). Teens. Bowling? Dancing? Freedom Station? Game day? Hiking? Teens--let us know what interests you! Activities will be provided depending on the interest shown by others on the Pre-Registration form, not only to participate, but to lead and organize. The number of organized Festival activities we have will depend on everyone's willingness to volunteer! SHOPPING for needs or for fun. Town and countryside exist in close proximity. The camp is just 1.4 miles from restaurants, shopping centers, groceries, and other conveniences, and 3.3 miles from downtown Prescott. When you drive along Hwy 69 and on to Camp Yavapines you will pass all of the 5 major major shopping areas in Prescott including the Gateway Mall. YEOW! And you thought they only had antelope and cactus in Arizona! Freedom Station: Festival-goers who drive into Prescott along Highway 69 will first be greeted by the Town of Prescott Valley and its Entertainment Center and Freedom Station. Kids of all ages will enjoy “Freedom Station” with its games, miniature golf, etc. The Entertainment Center has a 12-plex theater and restaurants. Northeast intersection area of Hwy 69 and Glassford Hill Road. St. Michaels Hotel. Old-time ambience, history, and elegance is a key here. Located on the Courthouse Plaza. The Rose. Enjoy the evening air and outside dining (expensive) one block away from the Plaza. Zekes Eating Place. So much food you may take some home with you. Located near the Prescott Valley Entertainment Center and Freedom Station. Fain Park in Prescott Valley with its small scenic lake, history artifacts, and archeology. Fort Whipple Museum at the Veteran’s Hospital (the old fort site) tells the history of the Fort which was founded to protect the gold seeking prospectors. Historic Downtown Prescott walking tour offers how it all got here–including historic Whiskey Row. Smoki Museum tells the story of how economics played a role in the town and its relationship with the native Americans. Be sure to take the docent-guided tour to get the complete story to make your visit worthwhile. The Southwest is noted for many of Our Father’s creative handiworks. Here are some suggestions for making the most out of your Festival time. Grand Canyon. What more can we say about this famous landmark? If you think it is just a big ditch in the ground, walk the Kaibab Trail for one hour into the bowels of the canyon. Then you will walk out with a finer appreciation of its wonders and grandeur! One hour down, about 2 hours up…and take plenty of water. Stand to the side when he burros pass. The canyon is located about 2 hours north of Prescott on Highway 89.
down the creeks slippery rock slides. It's located north of Sedona on Hwy 89A. Call 928.282.3034 for current costs. Verde Valley Train. Combine your stop in Jerome with a train ride into a canyon. www.verdecanyonrr.com. Williams Train to the Grand Canyon. Wanting another choo-choo experience? Take the train to the Grand Canyon from Williams, AZ. Monument Valley. The famous scenic location of many Hollywood movies directed by John Ford. Painted Desert. This colorful soils and rocks can be found north of Flagstaff along Highway 89 and at the Petrified Forest. Petrified Forest National Park. Located near the Meteor Crater, this park is noted for its colorful petrified rock (please don’t pick any to take home-it’s illegal) and the colorful soils and rocks of the Painted Desert. Sunset Crater National Monument. Did you know that a Hollywood movie producer once wished to blow it up with dynamite? The crater is a scenic dormant volcano located about 20 miles northeast of Flagstaff on Hwy 89. Explore the colorful aspens at Lockett Meadow west of the monument and Hwy 89 and be prepared for a narrow, gravel road with great views as you drive to the meadow.